FUGUE is a Perth based theatre making collective with a history of creating innovative and physically demanding works including last years much lauded Court My Crotch. 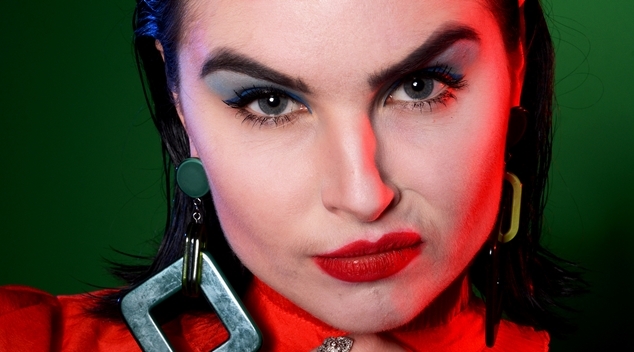 They’ve come together with Melbourne based artists Indigo Keane and Nicole Harvey to birth Silence My Lady Head, on at the Blue Room Theatre this week as the yearly Fringe Festival madness draws to it’s inevitable close. Drawing its title from the PJ Harvey song Man-Size, Silence My Lady Head is an ode to rule breaking female performers. Featuring covers and original tracks, all with an 80’s flair, Silence My Ladyhead opens with a distinctly Kate Bush music video vibe. Lady Head, played by Keane, crawls across the floor wreathed by machine generated smoke before rapidly transforming into a slightly desperate cabaret singer begging for the approval of her audience. Much like the rock star she aspires to be, Lady Head disregards the rules of theatre and engages with the audience. At one point Keane stops, paranoid and distressed, and asks an imaginary audience member what they said, invites them to come up on stage, demands they come into the light and repeat what they said in the dark. As she humiliates those who seek to humiliate her (even if the heckler is purely a narrative device) Lady Head makes clear the dichotomy of vulnerability and power inherent in being on stage. Silence My Lady Head explores the tension between performer and character as their sometimes competing agendas fight for control of the stage. This climaxes in a spectacular faux exorcism – but it’s not quite clear whether that is of performer from character or vice versa. Soaring from the glorious heights of high camp Gothic to a kind of emo karaoke and back again, Lady Head never quite hits the mark. I left confused and disoriented, although – and this speaks more to the conviction of the performance than anything else – also haunted by Lady Head and Keane.